I am going to hook up an L6-30 Receptacle at my Parent's house. Their main panel is in the garage right next to the garage door and I'll only need a few feet of cable. The question is what gauge wire should I use? How many conductors including the ground wire? How do I wire it up? The EVSE I have now at home is a 40A unit and I used a two pole 50A Breaker. It used only 3 wires, (1) Neutral & (2) Hots if I recall correctly. I'm pretty sure that the L6-30 uses a Ground, Neutral and Hot? If so then I guess it's not 2 Pole?, Sorry I'm a little confused. I can just ask my next door neighbor when everything shows up but I want to be prepared and order everything i need now. 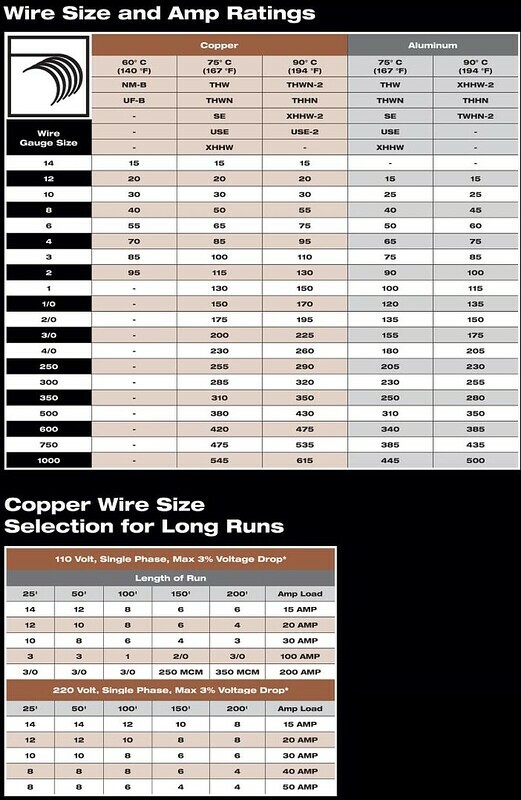 I would go with #10 wire and 30a double breaker for a short run. L6-30 is two hot and ground. This is a recommended wire run, and my disclaimer: This is for informational purposes and constitutes only readily available info. not to be considered advise on electrical circuits that can kill you if you are not prepared. By the chart (which is very clearly on the overkill side) 6 feet of #10 wire to a 40 amp breaker fits the bill, but I'd use a 30 amp breaker if it is dedicated for the EVSE Upgrade only. You should never pass above 20 amps on the upgrade brick. Wire should be 10-2(2 conductors and a ground) and depends on code for your area for conduit/sheath. Enclosure should be done for worst case scenario. A box to code and mounted so that the plug fails instead of the box in case someone snags the EVSE cable with the ICE car. you basically need a dryer plug but then again, they can vary. the one you have linked to should be fine. as far as "poles" commons and grounds dont count. so your two poles would be the two 120 volt legs. your home circuit is probably grounded thru conduit or the case. as far as wiring, go with 30 amp. your EVSE is current settable. set it at 24 amps (you cant go over 25...) and you will be within your safe level for 30. if you set it higher, you have to change EVERYTHING including the plug. general rule of thumb; continuous load is 80% of rated circuit so if you have 30 amp circuit, 24 continuous amps like your EVSE is it. I have 30 amp plug (dryer plug...at least that is what the permit says which is $40. an EVSE permit which would have been essentially the same thing was over $100) but its in an ancient circuit panel that has a crap reputation. So I wont run over 20. Why do you have a 50 amp breaker on the home unit instead of 40? My thinking usually is it never hurts to go a little heavier on the wire gauge than the recommended minimum, but with circuit breakers bigger is not better, you're better off with the *smallest* breaker that comfortably handles the load. In fact for the outlet for evseupgrade unit maybe a double pole 20a breaker. Curious what others say about that. In fact for the outlet for evseupgrade unit maybe a double pole 20a breaker. Curious what others say about that. The evseupgrade for the 2013 LEAF allows for a higher current, so you'll want more than a 20a breaker. LTLFTcomposite wrote: Why do you have a 50 amp breaker on the home unit instead of 40? I'm beginning to think that Lasareath here doesn't quite have the knowledge yet to avoid burning his house down - these are all basic electrical questions and either one needs to do the research to learn them, or one should hire an electrician. For a short run like this, the cost should be nominal. Certainly cheaper than dealing with a garage fire. 1. Circuit breakers should never be oversized for the wire and devices they protect. Break this rule and YOUR HOUSE WILL BURN DOWN! 2. Wires should be sized according to NEC rules. Oversize your conductors and you also must oversize your ground. Ignore that chart that was posted by joewaters, it does NOT comply to NEC standards. Ignore this warning and YOUR HOUSE WILL BURN DOWN! 0. Pull permit from local jurisdiction. 1. The L6-30 receptacle you linked to is fine. I would mount it in a metal box with metal faceplate. I would personally use a 4x4 box for the extra room. 2. You should be using 10 GA wire for a 30A circuit. You can use NM-B (aka romex) which you can get with 2 HOTs and a ground. It will be called "10-2 NM-B". The 10 is the wire gauge, 2 is number of current carrying conductors. It will have an appropriately sized ground (10 GA in this case). Note that if the romex will not be covered by drywall, you can not use it. Romex is only rated for use where people are not able to touch it. In which cause you must use conduit and individually stranded wire. 3. Make sure your metal box is grounded. 4. You will need a double pole 30A circuit breaker appropriate for your panel. I hope it goes without saying that you should cut power to the panel before working on it! 5. Get work inspected by your local inspector. This table is for 12v primary circuits that are not bundled or in conduit. Building code is different. 30a 240v connector needs #10 wire and 30a double breaker. Thanks for your concerns, my next door neighbor is a Licensed Electrician with 30 years experience. Lasareath wrote: Thanks for your concerns, my next door neighbor is a Licensed Electrician with 30 years experience. Good to know - he should be able to help you out. For a few beers he'll probably walk you through the install! Thanks, that wasn't clear from your post - 40A EVSEs are not common.